The young Shivudu is left as a foundling in a small village by his mother. By the time he's grown up, it has become apparent that he possesses exceptional gifts. He meets the beautiful warrior/princess Avanthika and learns that her queen has been held captive for the last 25 years. Shividu sets off to rescue her, discovering his own origins in the process. As a side note, the film was originally produced to have both Tamil and Telugu spoken versions, but the version streaming on Netflix in the US is dubbed into Malayalam. 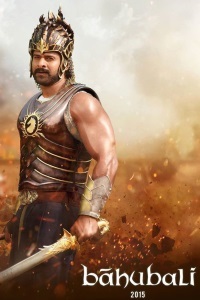 The most expensive film ever made in India at the time of its release, Baahubali was a massive international blockbuster, and remains among the highest grossing Indian films ever. It has an 85% fresh rating on Rotten Tomatoes. Correction to the post above: the film is in Netflix in both original Tamil and dubbed Malayalam versions. This is a really impressive spectacle movie and I don't mean that in a condescending for a non-Western film kinda way. It's an epic spectacle on the level of your Ben-Hur or Braveheart. It's huge, sweeping, visually ambitious, impeccably designed... the whole package. The great big huge caveat here--outside of the obvious one about how you'll need to be someone who can get on board with mythic style/scale battles, chosen one narratives, wartime beheadings, etc.--is that you will likely need to come at this from a vantage point of serious cultural relativity. Because you will definitely notice when the badass warrior lady turns all "Shivudu, save me!" after one roll in the hay. And how the savage Kelakaya are all super dark-skinned and their gibberish language sounds a bit like the pops and clicks from African Khoisan languages. If you can ride along with its wavelength--which also includes the prerequisite musical numbers--it's truly a spectacle. DoT, keep up your work here. I think possibly you are heading into kickstarter terrain. More! Are you going to do a Baahubali: The Conclusion post too? I think both movies are pretty great, with the two caveats you mentioned also being of important note, but with the first, the role women play in the two films, being a more interesting than suggests, even as that doesn't necessarily mitigate the more troubling elements. I'm hesitant to say more for just the first part though. What really sold the Baahubali movie(s) to me is the "barrel scene", which is the craziest thing (a good contender may be the tamil movie Robot, but I've not seen it yet). I plan on watching and reviewing part two this week. And yep, I agree, gusottertrout, in addition to some stuff that raises hackles in its handling of gender, there's also some seriously strong women in the first film. I have only seen the first one so far, but I was blown away by the tent/catapult attack. Even the wine jugs scene, minor though it was, showed really epic imagination. And Robot and its sequel 2.0 are both rip-roaring fun. I saw the latter in the theater in a packed house. A person could argue I was something of a Where's Waldo in the theater, but honestly, I think people were tickled to see an Anglo person getting in on the fun. More people should see 2.0. It's such a good time. I'm just getting started on The Conclusion now. I'll save talk of that for the post on that, but I will say that it's becoming clear that this is truly all one story and that the decision to make it two films seems to have more to do with logistics and running time issues than anything else. The first one is essentially two thirds one story, then the first part of a prequel. Then the second picks up from there. It's interesting how well that works, since it's so different from standard filmic conventions, at least as typified in western cinema. Yes, it's really a 5½-hour long movie, and the "prequel" straddles both episodes. In fact the "prequel" is the main story in terms of length: it's more than 3 hours by itself, vs a little more than 2 hours for the "sequel". And the "sequel" wraps up in 30 minutes! It's as if the Lord of the Rings narrative stopped at the end of the Two Towers, moved to tell The Hobbit, and once The Hobbit would be finished the narrative would speed through the Return of the King. It's certainly an unusual structure (at least for mainstream movies) but I don't know how common this is for Indian movies. Yeah, it's hard to talk about it in terms of either movie alone because both parts are needed to make full sense of it. At the same time though there is an interesting difference in tone and structure between the two, nothing enormous, but enough to be notable. The first movie has this really lovely mythic structure, where almost every scene plays out like a separate virtually self-contained episode, posing a situation Shivudu/Amarendra and Sivagami must understand and deal with, ending in an iconic moment of some sort. It plays like a number of little stories that build off each other leading towards a larger mythic frame the characters operate under and sets up an almost allegorical parable like take the second film will develop more in depth. The second movie is a little bit looser, digging into the characters more rather than feeling quite as episodic, better showing the connections between them and what they seem to essentially represent. It answers the first in a lot of ways, revealing the deeper significance of the actions the characters engaged in, even as they may not have acted out of the awareness of choice exactly.